Hotfix Era is a powerful application designed to set your imagination free in creating rhinestone templates, transfers and decals. This stand alone software is more than capable of standing on it's own for creating designs from scratch, but also can be tightly integrated with today's most popular graphics applications. Watch this extended refresher training course. Hotfix Era for Stencil Making uses the Windows drivers for your Plotter/Cutter to cut the templates out of the material of your choice. We strongly recommend using Sticky Flock. 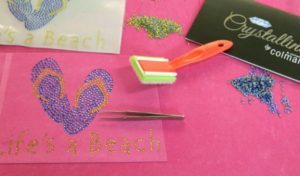 Find more information on complete Brush n Bake Rhinestone Systems and other Hotfix Rhinestones products on the rest of our site.